Free Shipping Included! St Miguel Market Food Gift Basket - Chef Ole - ENJOY LIFE, OPEN IT AND HAVE FUN PERFECT FOR WINE LOVERS. ARTISAN JAMS, OLIVE PATES, CARAMELIZED ONIONS WITH PORT & RAISINS, OLIVE FILLED W/FIGS, MUSSELS by Chef Ole Boxes LLC at 365 Days Of Kindness. Hurry! Limited time offer. Offer valid only while supplies last. Perfect Choice for Picnics, parties, mountain trip, beach get together . Take the best Spanish products impress your friends with the best quality. Perfect Choice for Picnics, parties, mountain trip, beach get together . Take the best Spanish products impress your friends with the best quality. This is a Great GIFT for any special occasions or event. Whether it is a birthday, anniversary, holiday, party, foodie day, thinking of you or a thank you occasion, this GOURMET GIFT BASKET is sure to deliver your special message with a punch! The # 1 corporate GIFT. ✔Perfect Choice for Picnics, parties, mountain trip, beach get together . Take the best Spanish products impress your friends with the best quality. ✔GOURMET GIFT BASKET: Take your food experience to the next level. Make each meal an adventure, awake your culinary creativity. ✔SUPER HIGH QUALITY: YOUR SEARCH IS OVER; YOU DON'T HAVE TO GO TO A STORE OR EVEN WRAP THIS. IT'S TOO EASY -Save the time and hassle of shopping. 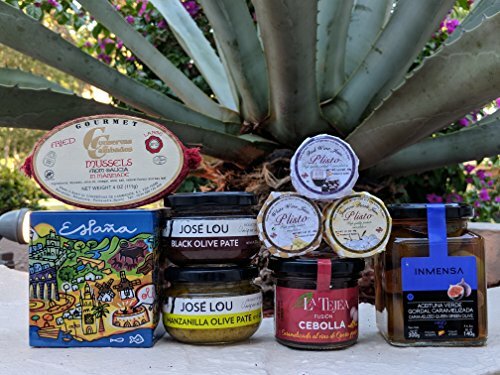 Ours GOURMET GIFT BASKET has only super high quality, hand-selected, Non GMO, ARTISAN made products 100% from Spain. ✔CORPORATE GIFT: any special occasions or event. Whether it is a birthday, anniversary, holiday, party, foodie day, thinking of you or a thank you occasion, this GOURMET GIFT BASKET is sure to deliver your special message with a punch! The # 1 corporate GIFTS. ✔TASTE & FLAVOR: Picture the smile on their face when they taste the new flavors from your Gourmet GIFT BASKET. YOUR RECIPIENT WILL LOVE THIS Gourmet GIFT BASKET OR WE'LL SEND YOU A REFUND! If you have any questions about this product by Chef Ole Boxes LLC, contact us by completing and submitting the form below. If you are looking for a specif part number, please include it with your message.